Scrip orders due Monday 9am since no school Friday! Orders that are to be sent home or picked-up, will be on Thursday of that week! Week of 4/22 NO SCRIP due to Easter Break. Scrip is “substitute money” that earns you money towards your family’s tuition and Kuemper's general budget. When you purchase scrip from Kuemper, you are purchasing gift cards to businesses, both local and national. Example: You purchase $100 gift card to Fareway through Kuemper's scrip program, you pay $100 to Kuemper, and you receive a $100 gift card to Fareway. Each business sets their own percentage that they donate back to Kuemper and your family's tuition account. There is no extra money spent, just money earned. Submit your orders by using the traditional paper order forms. Submit order forms and pick up orders at any Kuemper office. All orders received on Tuesday by 9:00am will be filled by Friday. Print and fill out traditional order form. Place your order online; pick up and pay for your order at any Kuemper office. Go to ShopWithScrip.com and click on "Family Sign Up" to create an account. You will need Kuemper's enrollment code; please contact Sarah Muhlbauer for the code. sbmuhlbauer@kuemper.org. Get virtual gift cards instantly! MyScipWallet.com is powered by the ShopWithScrip.com website and is designed to be used on mobile devices. MyScripWallet.com enables you to purchase scrip instantly on your smart phone. The cashier just scans your bar code on your phone (a.k.a. - your scrip gift card) at checkout. You can also enter the gift card code provided when making online purchases! Just think, anytime you use Amazon or Old Navy - USE SCRIP! Visit MyScripWallet.com and sign in using your existing ShopWithScrip.com username and password. Make sure to enroll with Presto Pay (linking to your bank account for payments) if you haven't already! Pay for your order online using an electronic funds transfer system (debit from your checking account). This allows you to skip the hassle of paying with cash or checks. To enroll in PrestoPay, login to your shopwtihscrip.com account and click on PrestoPay to get started. The quickest way to get scrip! Order ScripNow ecards, pay with PrestoPay, and receive your ecards within minutes. Print your ecard and redeem it in the store or enter the ecard code for online shopping! This is great for last minute shopping trips! Become a future family and start banking tuition credit before your future Knights are even born. Plan ahead and start using scrip today! 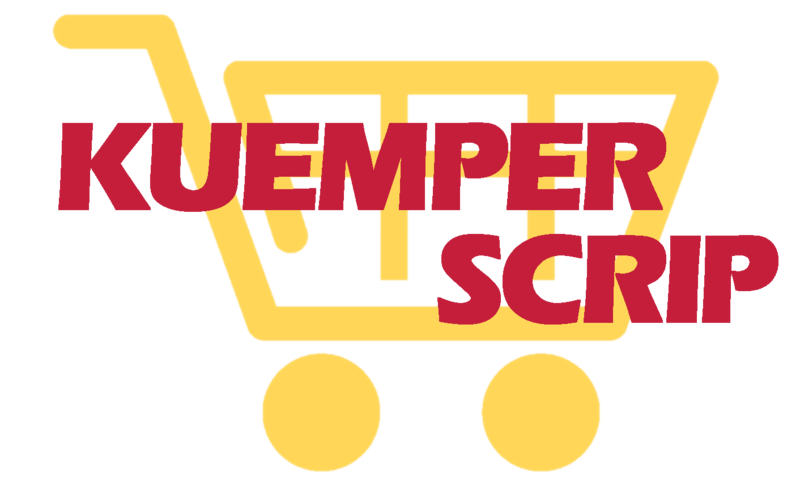 You can designate your scrip tuition crredit to any student, future student, or towards your parish's assessment for Kuemper. Grandkids, neighbors, and friends would love the gift! Did you know that 91% of scrip purchases are to local businesses? Please continue to support the community and shop local!